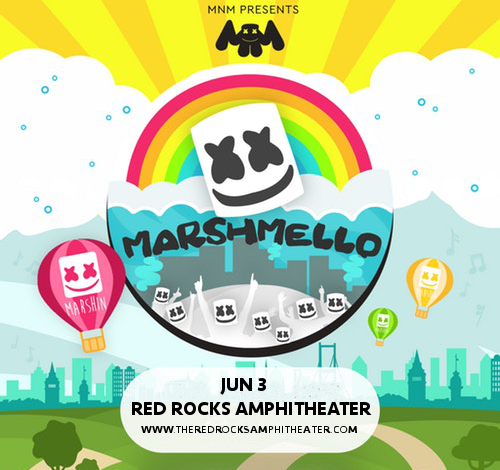 Anyone who remember’s Marshmello’s scorching performance at the Red Rocks Amphitheater before has been hankering after another one – and now, here it is!! As part of his Melloville tour, the masked DJ will return to Red Rocks Amphitheater on Sunday 3rd June 2018 – it’s going to be a party like nothing you’ve ever seen before!! Get ready for an incredible night – tickets will sell fast so don’t delay!! Grab your tickets NOW!! Christopher Comstock, better known by his stage name Marshmello, rose to prominence remixing artists such as Jack Ü and Zedd, and earned further recognition when he received support from DJs such as Skrillex, who reposted his song "FinD Me" on his Soundcloud page. Since then, Marshmello has gone from strength to strength, collaborating with a huge and diverse range of artists from Lil Peep to Slushii and Ookay. His song “Alone,” charted on the U.S Billboard Hot 100. Known for his distinctive helmeted onstage persona, inspired by Deadmau5, and his bass-heavy, synth-laden style of electronic music with a focus on groove, Marshmello has been one of the biggest rising names in electronic music over the last three years. Get ready to experience Marshmello’s live show for yourself – grab those tickets and get ready to dance! !